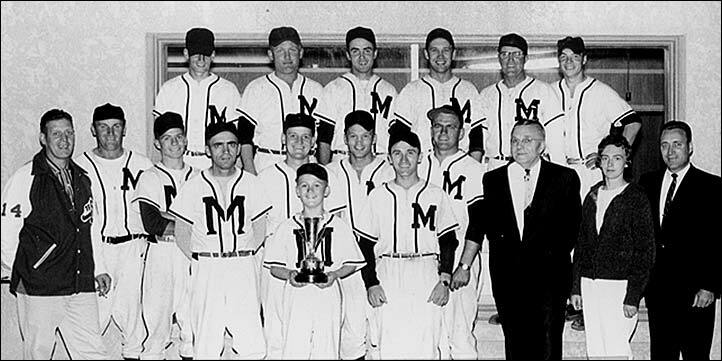 The Melville Millionaires, of the Garry League of Saskatchewan. Back row (left to right) - Doug Biro, Al Kosteroski, Edwin Miller, Larry McWilliams, Gil Boyle, Mel Biro. Middle row - Hap Edwards (treasurer), Hank Konechny, George Pirie, Hermie Weitzel, Cliff Mein, Helmuth Hack, Ed Pirie (president), Loretta Olson (scorekeeper), Dr. O. Millette (team physician). Front row - Jack Whittmire (manager), Harvey Whittmire (batboy) and Peter Sawchuk. Photo courtesy of Brian Hicke.